In modern implant cases, we have the option of using a closed-tray technique, an open-tray technique or a digital impression scanner. Each technique has its positives and negatives, and one technique usually works better than another in certain situations. To date, digital scanning technology has less than 10 percent market penetration in the U.S., so this article will focus on the open- and closed-tray techniques. The discussion will concentrate on when and where to use each technique to maximize clinical success, increase patient comfort and minimize frustrations. The restorative side of implant dentistry is the culmination of many months of planning and attention to detail to achieve a precise final result. A keystone in the restorative process is capturing the final impression. One of the important choices the restorative dentist needs to make at this point is whether to take the impression with a closed- or open-tray technique. Both can provide the desired result but in some situations one can be preferable, or even required, to get specific information. In an open technique, the post extends past the tray and will need to be unscrewed before the impression can be removed from the mouth. 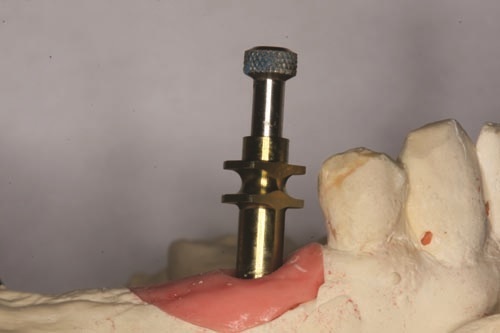 In a closed technique, the post is captured within the impression; after it is removed, the post is unscrewed from the implant and reinserted. Because the closed technique requires the removal and reinsertion of the impression post, it has with it an inherent—though small—opportunity for error. The reinsertion and exact approximation of the post into the impression material requires close attention to detail. Any error in this step will be carried through the entire fabrication process and ultimately lead to failure of the final restoration. So how do you decide when to use which type of impression? In my office, when restoring a single-tooth implant, I use an open technique unless the clinical situation makes it challenging or impossible to do so. Such scenarios most commonly happen when restoring a second molar. Often, a patient cannot open wide enough to accommodate the removal of the post from an open impression. There are also times when an open technique cannot be performed with a first molar on a patient with a limited opening. It is important to confirm before taking the open-tray impression that you will be able to have access for removal of the impression post. 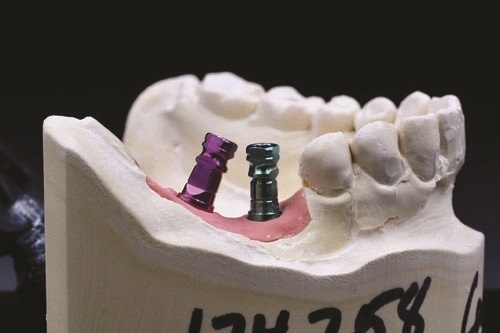 When doing impressions of multiple implants, the decision becomes even more critical. A contraindication for a closed technique is when you are taking an impression of multiple implants and the implants are not close to parallel (Fig. 1). 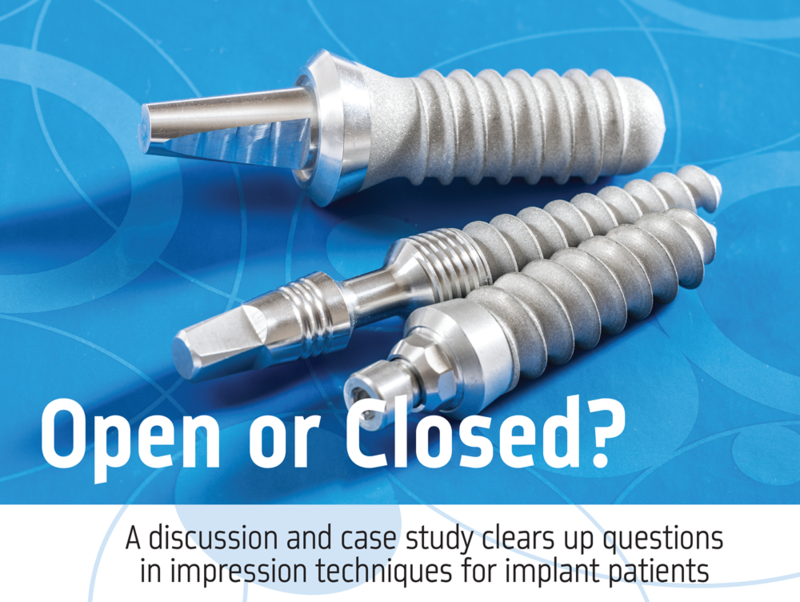 If you were to take a closed impression of nonparallel implants there is a significant risk of locking the impression in the mouth, a situation we want to avoid. Depending on the placement or angulation of the implants, I’ve sometimes used a combined approach of a closed impression post on one implants and an open impression post(s) on another. 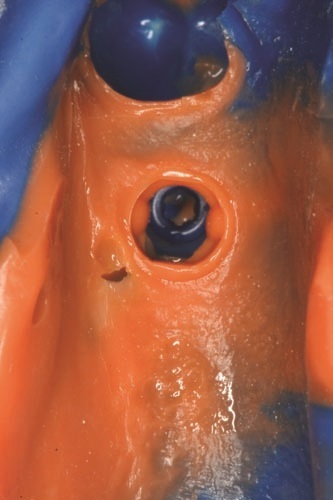 When doing multiple implants, the open technique also provides the advantage of allowing the clinician to splint implants together to further improve impression stability and accuracy. Impression technique discussion is not complete without a mention of impression tray selection. Laboratory technicians will almost always agree that full-arch impressions are the desired method. “A full-arch impression provides better stability of the model and will increase the accuracy, functional anatomy and aesthetics of the final restoration,” Johnston said. This leads into the discussion on custom versus stock impression trays. For one or two implants the use of stock trays is generally regarded as acceptable. Once you move to three or more implants there’s some debate, but not universal agreement. Clinicians would be wise to consult with their laboratory if there is any question here. When you move onto full-mouth restorations with implants, most dentists and technicians agree that a custom tray is preferable. Last is the discussion on the impression material selection. As mentioned before, a vast majority of the time, implant impressions are best taken as full-arch impressions. As we know, impressions can be uncomfortable for many patients. When an open technique is used, there can be even more discomfort, because the clinician needs to remove the impression post pin(s), which adds more time the impression is in the mouth. When deciding on an impression material, specific characteristics matter, like accuracy, speed of application, tear strength, set time and hydrophilicity. I have found that V-Posil by Voco meets the criteria for implant impressions. The material has demonstrated excellent tear strength, accuracy and hydrophilicity and has an adjustable working time. The material is sensitive to heat, and the set time will accelerate when the material goes from room temperature to the warmer temperature of the mouth. Once placed intraorally, the material’s set time is accelerated and comes to a “snap set.” This provides increased stability of the impression and helps to capture the accuracy required for implant impressions. This case study shows an open and closed impression for comparison purposes. Tooth #29 had been replaced with an implant four months previously and is now ready to be restored. The first impression is taken with a closed technique. In Fig. 2 (p. 81), the final impression has captured the impression post imprint. The impression post is then unscrewed from the implant and carefully inserted into the impression and sent on to the lab. Next, we used an open technique. Fig. 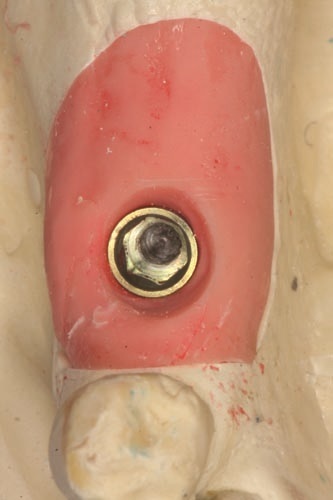 3 demonstrates on the lab model what this would look like in the mouth, with the impression post sticking out well above the occlusal plane, allowing for the post to be unscrewed and released from the implant before the impression is removed from the mouth. Fig. 4 shows the final impression using the open technique. Both impressions were sent to the lab and poured up. We asked the technicians to choose which impression they thought would be most accurate, and they decided to work with the open-tray impression. Fig. 5 shows the soft-tissue working model with the implant analog in place. 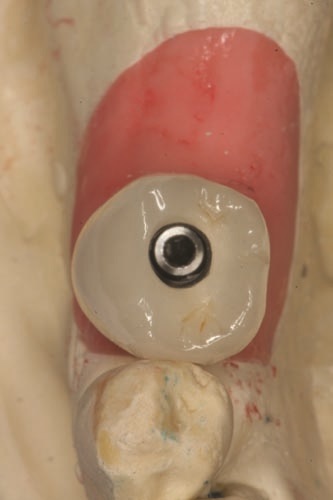 Using this model, the final screw-retained PFM implant crown is fabricated and ready for delivery in Fig. 6. At delivery the fit and aesthetics were excellent, and the seat appointment required less than 10 minutes to complete. 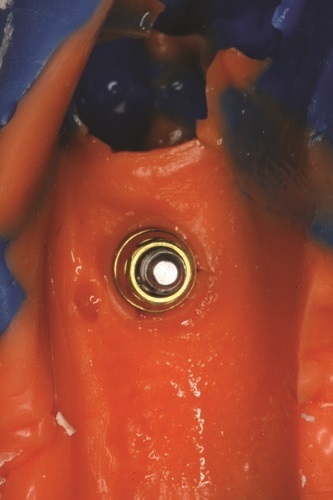 Open- and closed-tray impressions for implants can both provide the desired results, given attention to detail and good technique and materials. However, one technique does not fit all clinical situations. The clinician is wise to judge each case individually and determine which technique is best. Having these two options available will allow you to consistently make the best choice for your patient and provide excellent results. 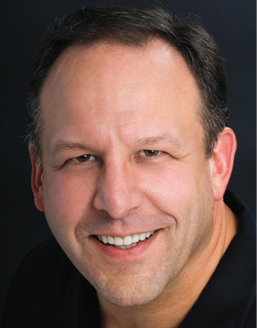 Dr. Gary M. Radz maintains a private practice in downtown Denver and a faculty appointment at the University of Colorado School of Dental Medicine. He is a founding member of Catapult Education. 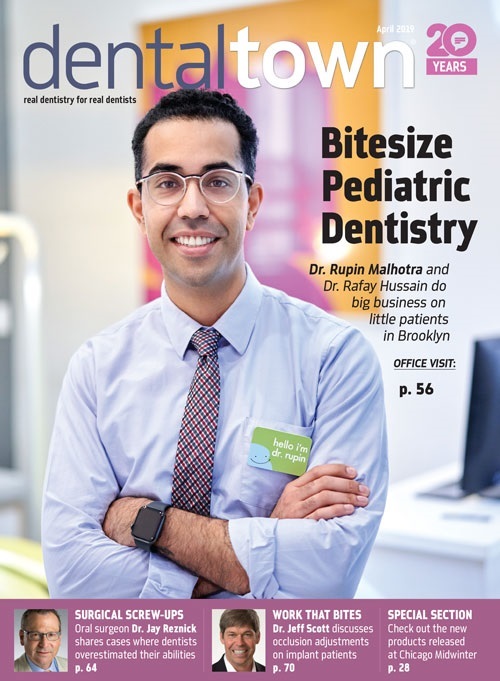 Radz, who speaks internationally on cosmetic and restorative dentistry, also serves on the editorial board of seven dental journals. He would like to recognize the talents of the technicians at Maverick Dental Labs in Monroeville, Pennsylvania.